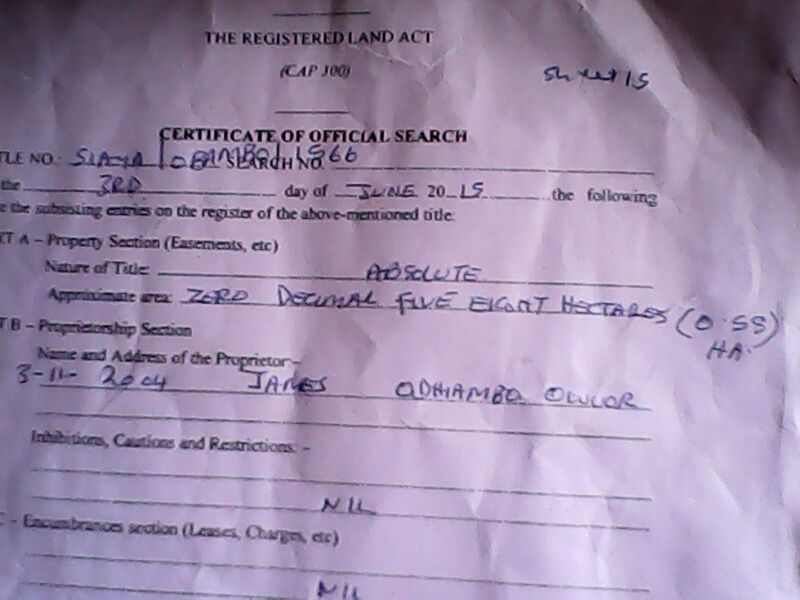 It is now 3 weeks since i discovered that some rich stranger had transfered our family land into his name illegaly without our consent .The land in question was bought by my late father MR.LUCAS OMOLO in 1989 a few months before his death.I was a young boy then .There have been 3 widows who have been residing in it since that time,unfortunately one passed on in 2006 and now the remaining 2 Widows are jobless and cant find any way to stop the person.The whole family is relying on me to help them. I talked with the person to give us back our part of land and even though he promised to come.however he has not shown up like he promised.I know the guy has taken advantage of our poor status .Need your help in whichever way you can.There are widows and orphans who need my help to stop them from being homeless which will add pain to the current poverty condition they are going through.Going to court will need money to help us.God bless you as you pray with us to win this battle..its like the battle of David and Goliath. ANY HELP WILL BE APPRECIATED..SAVE THE WIDOWS AND ORPHANS ..GOD BLESS YOU.